Last summer, my friend Miriam and I sat around on a warmly lit porch and enjoyed refreshing mojito drinks once a week. These cookies were inspired by those beautiful nights and fun conversations. 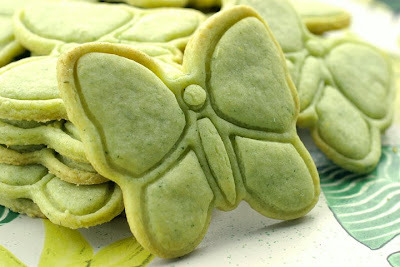 I used a stencil cookie cutter to cut out the butterflies. Of course you can use any shape cutter you prefer. 1. In a food processor blend until fluffy mint leaves, zest of lemon and limes, lemon and lime extracts, butter, sugar, and salt. 2. Next pulse together egg, baking powder, and baking soda. Then add the flour and pulse until just mixed, be careful not to over mix. 3. Store in a covered container in the refrigerator for one hour or more. 4. Set the oven rack in the middle and preheat to 350 degrees. Cover two cookie sheets with parchment paper and set aside. 5. Roll out the dough in small batches to 1/8th inch thick. Cut out with a cookie cutter and place on the parchment. 6. Bake for 11 to 13 minutes or until light golden brown around the edges. 7. Let rest on the baking sheet for 2 minutes and transfer to a cooling rack.Makes about 23 cookies depending on size. 1. Cooking time may need to be adjusted for smaller or bigger cookies. These cookies are 3 inches long and wide. 2. If you don't have lime extract, try adding the zest of an additional lime. This is a really creative recipe. Very, very interesting. I am loving the idea behind these cookies. They're so pretty too, perfect for spring/summer! Thank-you Sophie. This recipe is all of two days old. If you try it I'd love some feedback! I've run two tests so far with good results, but it's very helpful to have input from people who aren't connect to the project. These sound fantastic! Into my recipe file for sure! I love the way they look also. I haven't seen that kind of cutter before. This is my first visit to your page and I love it. The first thing that struck me (aside from your fabulous photo) was how quickly your page loaded. So many pages now are very slow to load because of all of the "stuff" they have on them. When I went to your page it popped right open...bravo!! I just joined your group of followers, I'm looking forward to future visits. Thank-you Coleen! I am so happy to have you. Cool looking cookies! You said that you used a stencil cookie cutter. What is exactly is that? They sure give your cookies a unique look. Great cookie recipe! We loved it. I couldn't find lime extract so, I used a little more lime zest. I also used some rum extract to give it the mojito ummffff! I am so happy they turned out well Jenny, and the rum extract was a wonderful idea! These look great! Mojitos are our favorite drink (we're not big drinkers, lol), and I love to see those flavours used in other foods. Nice! Lol! I should write it out soon. How do you think I got the idea? YUM! What a fun idea! I'll be linking to this if you don't mind! I appreciate that. Thanks Rachel! Ahhhh these are so cute!!! Just came across your blog and love it! These cookies sound really interesting. I think this will be my weekend project. Just wondering... what's the texture of these cookies supposed to be like? Soft, tender? Or crispy? Thanks! They are kind of like a soft shortbread in texture. Sugar cookie like. Um, this is really difficult to describe. Your blog is a dream!! These cookies look scrumptious!! I cannot wait to try them and yay for visiting with good friends! Thank-you Taci. I tried to leave a comment on your blog, but couldn't find the comment button. I hope I didn't just miss it. That looks Deee-licious! Love this idea :) Come on over and link up to MMM!